Infographics are a fun way to promote yourself and your brand. They come in various shapes and sizes and if you're confident in using presentation software like PowerPoint or Open Office, they are quite easy to make. To create an infographic in PowerPoint, first select the size of slide on which you wish to work. From the Design tab, click on Page Setup, first icon on the left of the toolbar and in the drop-down menu presented, choose your size. It can be slide size or as I have chosen for this example, an A4 page size, with portrait orientation. Back on the Home tab, choose New Slide. You can use a layout with the title or as I have, select a blank slide. The insert tab allows you to insert pictures, clip art, graphs, text which you can move by right clicking with your mouse to drag wherever you like on the slide. I like playing with the rotation options –find rotate on the formatting tab. Choose options and you can watch your chosen picture or shape rotating as you increase or decrease the degrees in the selection box. For this infographic, I inserted a bar chart--simply done by clicking on the chart option and filling in the figures you want to show, lots of book cover pictures from my computer, a logo, and a post-it note made from one of the shapes in the shape option--just love those curled edges. I then used the fill option to color the shape yellow. Insert a text box into the shape and hey presto, you have a notelet. Again these can be expanded to fill the whole space if required. Mini warning. Best rotate your shape into position before adding text. I had loads of upside down and sideways text before it dawned on me what I was doing wrong! When happy, save your file as a jpeg and you can insert it into your website and promo material. 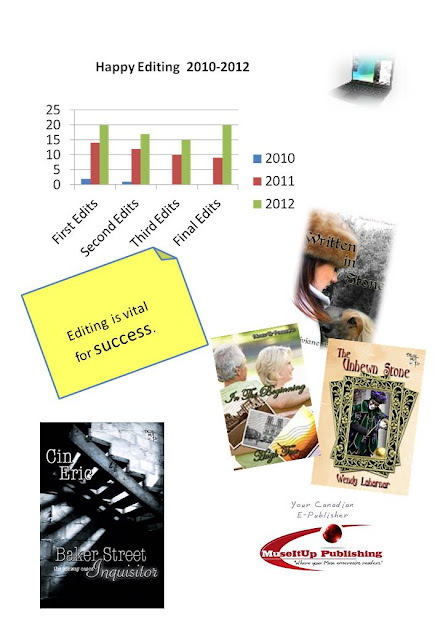 Anne Duguid is a senior content editor with MuseItUp Publishing and her New Year's Resolution is to pass on helpful writing,editing and publishing tips at Slow and Steady Writers far more regularly than she managed in 2012. Too late now I hope, Karen There were two i's in is in the little yellow sticky note. Now redone. If you create several slides and save each as a jpeg, then you can stack and rearrange them as a truly informative infographic. I've always loved infographics and you make them seem quite easy to do. Thanks! Like you, Maggie,I love the best of them. There's a great pie chart showing popularity of Kindle categories somewhere on CopyBlogger. Once I found out how many sizes of slides I could make and that I could save them as jpegs, I could see how everything fits together. Thanks Annie. I've always looked at these and thought I'd like to do one sometime. This post makes it sound doable. Good to know. I learned something today. Thanks for the post! Thanks Debbie and thanks too for your link to poisonous plants on Faye's recent post for mystery writers.